Salmon is the common name for several species of fish in the family Salmonidae. 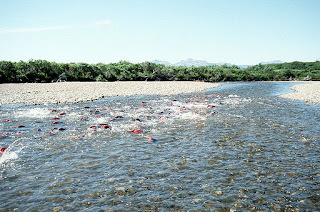 Several other fish in the same family are called trout, the difference is often said to be that salmon migrate and trout are resident, but this distinction does not strictly hold true. Salmon live along the coasts of both the North Atlantic (one migratory species Salmo salar) and Pacific Oceans (approximately a dozen species of the genus Oncorhynchus), and have also been introduced into the Great Lakes of North America. Salmon are intensively produced in aquaculture in many parts of the world. Typically, salmon are anadromous, they are born in fresh water, migrate to the ocean, then return to fresh water to reproduce. However, there are populations of several species that are restricted to fresh water through their life. Folklore has it that the fish return to the exact spot where they were born to spawn, tracking studies have shown this to be true, and this homing behavior has been shown to depend on olfactory memory. The salmon has long been at the heart of the culture and livelihood of coastal dwellers. Many people of the Northern Pacific shore had a ceremony to honor the first return of the year. For many centuries, people caught salmon as they swam upriver to spawn. A famous spearfishing site on the Columbia River at Celilo Falls was inundated after great dams were built on the river. The Ainu, of northern Japan, trained dogs to catch salmon as they returned to their breeding grounds en masse. Now, salmon are caught in bays and near shore. Salmon population levels are of concern in the Atlantic and in some parts of the Pacific. Alaska fishery stocks are still abundant, and catches have been on the rise in recent decades, after the state initiated limitations in 1972. Some of the most important Alaskan salmon sustainable wild fisheries are located near the Kenai River, Copper River, and in Bristol Bay. Fish farming of Pacific salmon is outlawed in the United States Exclusive Economic Zone, however, there is a substantial network of publicly funded hatcheries, and the State of Alaska's fisheries management system is viewed as a leader in the management of wild fish stocks. In Canada, returning Skeena River wild salmon support commercial, subsistence and recreational fisheries, as well as the area's diverse wildlife on the coast and around communities hundreds of miles inland in the watershed. The status of wild salmon in Washington is mixed. Out of 435 wild stocks of salmon and steelhead, only 187 of them were classified as healthy; 113 had an unknown status, 1 was extinct, 12 were in critical condition and 122 were experiencing depressed populations. The Columbia River salmon population is now less than 3% of what it was when Lewis and Clark arrived at the river. The commercial salmon fisheries in California have been either severely curtailed or closed completely in recent years, due to critically low returns on the Klamath and or Sacramento Rivers, causing millions of dollars in losses to commercial fishermen. Both Atlantic and Pacific salmon are popular sportfish. Salmon populations now exist in all the Great Lakes. Coho stocks were planted in the late 1960s in response to the growing population of nonnative alewife by the state of Michigan. Now Chinook (King), Atlantic, and Coho (silver) salmon are annually stocked in all Great Lakes by mosts bordering states and provinces. These populations are not self sustaining and do not provide much in the way of a commercial fishery, but have led to the development of a thriving sportfishery. Are you going to 2011 Foodbuzz festival? I'd like to go, but unfortunately, I will not be able to go. Leave me a comment. Love hearing from you. Heat oil in medium skillet, over medium heat. Combine canned salmon, egg, 1/4 cup bread crumbs, garlic powder, salt and pepper. Form into patties and dust each patties with additional bread crumbs. Fry until golden brown, about 3 minutes on each side. Enjoy! The salmon croquettes look yummy. I love salmon and luckily there is plenty in the northwest. :) I thought about going to the festival, but we had to much going on for me to commit to it so I opted not to go. Sorry if I post this twice as I thought I posted but I'm slow today lol...... The salmon croquettes look fantastic and I love salmon. Luckily I live in the northwest where there is plenty of it around. I thought about going to the festival but opted not as we have to much going on. I am sure I'm missing out on a lot of fun. I have had these at a restaurant before but have never attempted to make them. This recipe does look fairly easy and the ingredients are not hard to come by. I have saved the recipe-yum! Salmon is one of my fave things to eat. My dad used to go salmon fishing quite often so we were able to experience fresh salmon as kids. This is a lovely recipe. No need to say sorry, it's alright. I'm going to try this recipe...it may not be till Lent, but I've always wanted to make some sort of salmon pattie, and this looks perfect. Oh these look so delicious, I love salmon croquets! YUM! I love love love salmon croquettes! Can you send a few of these my way?! These look good--although living in Alaska, I'd have to make it with fresh salmon! Salmon is my favorite fish. I haven't ever eaten croquettes though. Like crab cakes almost? I will have to try some soon. This is absolutely delicious looking croquettes. I loves croquettes. I make these regularly (with a little fresh cilantro). Thanks for the great information, as always! I know I have said this before but I don't think I can ever say it enough. Thank you so much for all your wonderful comments. You and your comments mean the world to me. You guys rock! I enjoyed reading about the salmon. Having grown up in Pacific Northwest I am very familiar with salmon and steelhead. 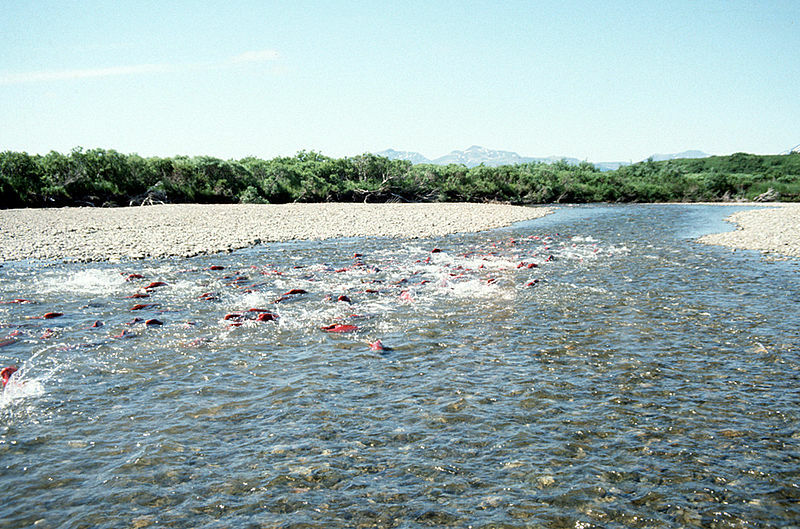 The Copper River salmon run was always something to look forward to. 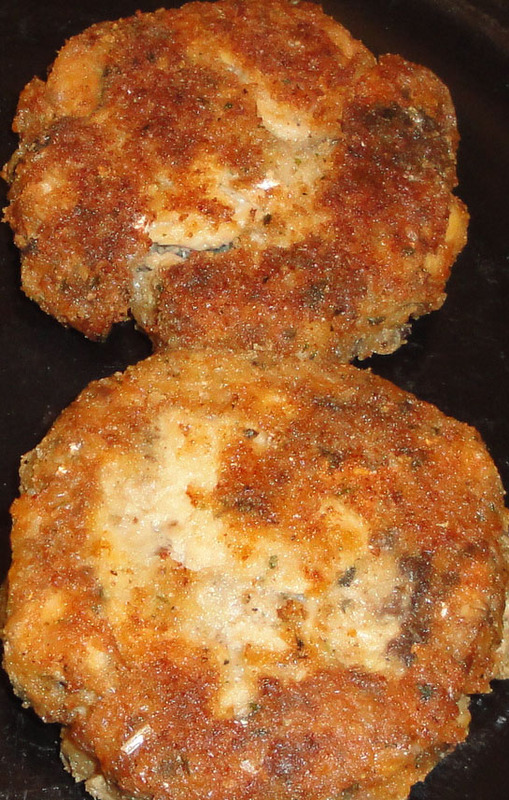 I remember my mother using our wild caught ocean salmon (after being canned) to make salmon patties. I will be sure to try out your recipe! Very interesting. Love salmon, your cakes look perfectly crispy! Thanks for this great looking recipe! I haven't had salmon like that since probably grade school. Thanks for your sweet comment on my post about our Oktoberfest, too! Stop by anytime - love to have the company. I'm so very sorry you have food allergies. These look wonderful!! I just made eggplant croquettes this week for dinner and then had the leftovers. I love that yours are salmon! I love the look of your croquettes...I am sure they are very delicious! I would love to attend the Foodbuzz festival if I have the chance! I've never tried Salmon cakes, but my sister makes them all the time. Maybe it's time to try them. Yours sound good and the recipe is simple - one of my favorite things! I love salmon! These look great Christine! Just like my nana used to make! These look fantastic! Living in the pacific northwest we get more salmon than i know what to do with! Bookmarking this one for sure! i've made salmon cakes before and they are so much fun to make. yours looks tasty! My mom swears my canned salmon! I've only made salmon cakes with leftover salmon..and I love it! I love salmon. This is a such a nice dish. Addition to my fish recipes. Thanks for sharing. Love it. I love salmon but I never really had "salmon" until I took a trip to the Northwest this summer and experienced it. WOW. these look so yummy. I adore the salmon! Those cutlets look droolworthy. I love salmon and your simple seasonings I'm sure allow the great flavor of the salmon to come out. Yum! I had no idea that salmon and trout were in the same family. My family loves salmon croquettes and would eat them everyday if I made them. I will try your recipe the next time. I LOVE croquettes and never thought to add salmon-amazing! The whole salmon run phenomenon is so interesting to me! These sound really good! Costco has this really great wild canned salmon that would be a winner for this dish. I'll have to remember this the next time I stock up. Love the history of salmon too! I always learn so much when I stop by. Thank you for the salmon background. That was interesting. I will try your salmon croquettes and adopt it to my Spanish recipe of "Croquetas." I will be using my leftover baked salmon. Croquettes are such a wonderfully old-fashioned food--nice to see a recipe for them! I really love croquettes and I actually do eat salmon a few times a year. Sometimes I can't resist.